Ruger introduced a Precision Rifle in .308 Winchester not long ago that has proven to be an accurate, reliable and useful rifle. Recently the rifle has been introduced in 6.5 Creedmoor, an exciting and useful addition. But Ruger has gone further and introduced a rimfire companion to the .308 Precision rifle. The author found the Ruger Precision Rimfire a pleasant shooter and accurate as well. The Ruger Precision Rimfire Rifle is an excellent rifle even if you do not own the center fire version. 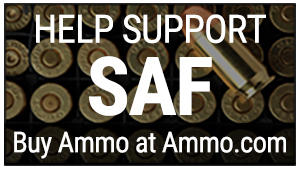 It brings big gun accuracy to the .22 rimfire cartridge. The ergonomics, trigger and manual of arms are identical to the full size center fire rifle. The Ruger Precision Rimfire rifle will be the ideal long range shooting trainer and rimfire match rifle. Like many modern rimfire rifles the Ruger Precision Rimfire rifle is threaded for a sound suppressor, affording even more versatility. The stock is a scaled down version of the Ruger Precision Rifle’s adjustable stock. This is a molded one-piece chassis that makes for absolute rigidity. The buttstock is adjustable and manufactured from glass filled nylon. This is a strong chassis and stock configuration that makes for excellent repeatable accuracy. The Ruger Precision rimfire bolt operates smoothly with excellent leverage. Length of pull and combat height are easily adjusted. I think that many shooters may not realize that the rifle doesn’t quite fit them, they simply adapt to what they have. With the Ruger Precision Rimfire rifle they may adjust the stock to the perfect fit. I like that a lot. My average self, my six-foot- two grandson and my wife were each able to get a good stock fit and excellent cheek weld with this stock. The individual shooter may address issues with prone shooting or heavy winter clothing with this stock. It is a very good set up. The stock is labeled the Quick Fit by Ruger and the name fits. It isn’t difficult at all to get a good fit quickly. Witness marks on the chassis help return to a previous setting if desired. To the best of my knowledge this is the only .22 caliber rimfire rifle available with a bolt throw adjustment. Many of us will leave the setting for the .22 Long Rifle bolt throw alone, but if you wish true practice capability with the precision center fire rifle, this is a neat trick. By removing a spring clip you change the bolt throw from 1½-inch to a 3-inch bolt throw. This makes the feel of the action identical to the center fire rifle. The short rimfire throw is faster and makes for quick follow up shots, but then this is a precision rifle for slow deliberate fire. Just the same for true under study use this adjustable bolt throw has much merit. The custom grade bolt handle aids in manipulating the action. The barrel is the heart of the rifle. The 18-inch barrel is cold hammer forged, according to Ruger, and manufactured from 4140 Alloy steel. The rifle’s precise rifling is part of the reason for the Ruger Precision Rimfire’s accuracy. The rifle also features a ½ -28 threading that is compatible with most sound suppressors. The fore end is a black hard anodized free floating design. There are Magpul M Lok slots on the four sides of the hand guard for mounting rails and other gear. The Ruger Precision Rimfire features a modern adjustable stock and a high tech handguard. The trigger action is also adjustable. The original AR 15-type grip and safety location are retained in the rimfire rifle. This makes for excellent leverage and handling. 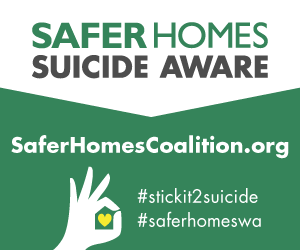 The safety is crisp and positive in engagement, but easily manipulated. The Ruger trigger action is very crisp. The trigger may be set for a pull weight of 2.25 to 5.0 pounds. I set the rifle at 3.0 pounds according to the RCBS trigger pull gauge. For all around use, stressing accuracy, this is an ideal weight for the experienced shooter. The rifle is supplied with a scope base for mounting popular rifle scopes. The Picatinny base accepts a wide variety of optics. The rifle is supplied with the new 15-round X magazine. Ruger’s original ten-round .22 Long Rifle magazine, introduced with the Ruger 10/22, is a model of reliability. Later, Ruger finally gave us the 25 round x magazine, a far more reliable magazine than a host of aftermarket high capacity magazines. The new 15-round size is ideal for most uses including firing off of the bench rest. Fiocchi’s 40-grain HV loading provided excellent results. For this evaluation I mounted an inexpensive CenterPoint rifle scope. While it isn’t expensive this optic has given good service on several rifles. 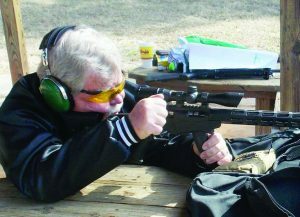 While I may fit something more advanced at a later date, the CenterPoint provided a vehicle for evaluating the rifle’s accuracy and did so on the cheap. I have fired this rifle extensively, running perhaps 2,000 cartridges in the rifle during the past six months. There have been no failures related to the rifle. In true rimfire tradition there have been one or two failures to fire and a single instance in which the soft lead bullet hung on feeding. This is common with the heel based rimfire cartridge. I normally test .22 Long Rifle ammunition from a rifle at 50 yards. At this range good quality rifles such as the Ruger 10/22 will usually exhibit a three shot group that falls within two inches. A quality bolt action rifle such as the CZ 455 will group into an inch or less. The ergonomics of the rifle are in a class all their own among rimfire rifles. The Ruger Precision Rimfire established its accuracy potential quickly, producing solid accuracy. Once I grooved in to the trigger and sights—and adjusted the stock for my own comfort—I began to see extraordinary results. It wasn’t unusual to fire a three shot group at 50 yards of less than inch. I have fired several commercial loads. 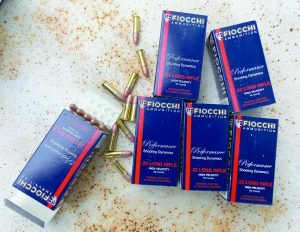 So far the best results have been with the Fiocchi 40-grain high velocity loading. I have tried standard velocity and special (expensive) target grade loads and, while some have equaled the Fiocchi loading, none have bested it. This is a clean burning load with excellent accuracy potential, and it isn’t expensive. The Ruger Precision Rimfire is an excellent rifle. As an understudy to the Ruger Precision .308 Winchester or 6.5 Creedmoor rifles it is in a class by itself. As a stand- alone .22 rifle the Ruger Precision Rimfire offers an edge in accuracy over most rimfire rifles. Yet at a street price of four hundred dollars or less, it is affordable. This is a fun gun that also may serve for training and small game hunting.